It may once have been ‘the Sun wot won it’ but in this year’s general election campaign, the Rupert Murdoch-owned tabloid’s support for the Conservatives is unlikely to prove decisive. That’s the takeaway I got from a Media Society event at the Groucho Club last week with Trevor Kavanagh, the political editor of the Sun from 1983-2005. Two decades ago the Sun said that its support for Conservative Prime Minister John Major in 1992 had swung the outcome of that year’s election, which pollsters expected the opposition Labour party to win. 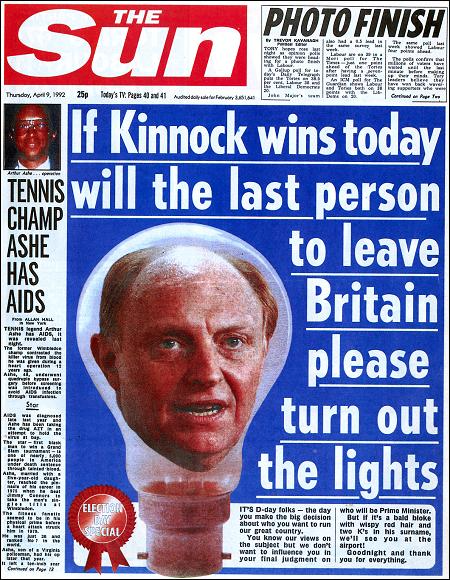 The newspaper, which then had a print circulation of almost 4 million, told its readers that if Labour’s then-leader Stephen Kinnock won, “will the last person to leave Britain please turn out the lights?” Two days later, with Major back in 10 Downing Street, the paper published a front page proclaiming “It’s the Sun Wot Won It”. Now the Sun sells roughly half as many copies, though it remains the U.K.’s most popular newspaper. “The difference between then and now is we don’t have the circulation we once had,” Kavanagh said. But the paper still holds huge influence because “Sun readers tend to move more,” said Kavanagh, who first met Murdoch as a young reporter in Sydney, Australia, and still talks to him about British politics. Contrast that with readers of other Tory-supporting titles including the Daily Mail and Daily Telegraph, who more reliably vote for the Conservatives. Particularly in an election where neck-and-neck polls show neither party winning a majority, the Sun’s swinging readers – and therefore the Sun itself – still matters. And it doesn’t pull any punches. “Labour’s sham manifesto is an insult to voters’ intelligence,” the Sun judged in an April 14 editorial the day after Labour launched its manifesto. “If your motivation is that Miliband will run the economy more sensibly than David Cameron, you should google psychiatrists in your area as soon as possible,” the editorial said. 60 per cent of the UK’s national newspaper market leans towards the Conservatives, an analysis of British newspaper coverage by the Press Gazette suggests. Just 12 percent favour Labour or the Liberal Democrats. Rupert Murdoch, worth about $13 billion, later described the Sun’s ‘wot won it’ claim as “tasteless and wrong” in testimony to the Leveson inquiry in 2012. “We don’t have that sort of power,” Murdoch said. The inquiry, set up in 2011 to consider press ethics in the wake of phone hacking allegations, represented a turning point for Labour’s relationship with the News International titles, which endorsed Tony Blair before each of his three election victories. Miliband broke ranks with other front-bench politicians, pushing the scandal – which engulfed Andy Coulson, the No. 10 communications chief – onto the political agenda. This academic paper from the late 90s takes a look at some of these issues in more depth. Personally, I don’t think newspapers do much direct persuading any more – if they ever did. But in so-called “agenda setting”, influencing what topics politicians, broadcasters and people in general talk about, their influence is probably still larger than any other column in public life. Update, May 1: The British Election Study has this bar chart graph breaking down the political allegiances of newspaper readers.